Mixmax integrates with the Greenhouse applicant tracking system. This integration is available on our Enterprise plan. Please contact Mixmax Sales to request access. These features are enabled in Mixmax Rules. To connect to Greenhouse, you must be a Mixmax organization administrator. If you are not an organization administrator, please ask for their help with this step. You will need your Greenhouse API key. Note that once an organization administrator has connected to Greenhouse, everyone else in the organization will automatically be connected. See details below, under Connecting to Greenhouse with your organization. 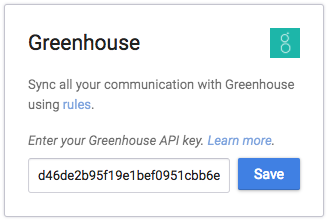 Your Greenhouse API is available if you are a Greenhouse administrator. If you are NOT an administrator in Greenhouse, ask your Greenhouse administrator for the API key and skip to step 6 below. Open Greenhouse, click the Configure tab, click Dev Center, and click API Credential Management. In the Description field, enter anything you'd like. Under Type, select Harvest. Alternatively, you can select all fields — but the 3 above are the ones you need. 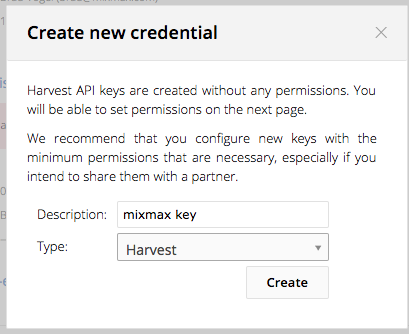 Open Mixmax Settings - Integrations, find Greenhouse, click Connect, and paste your API key from above. That's it - you've connected to Greenhouse! 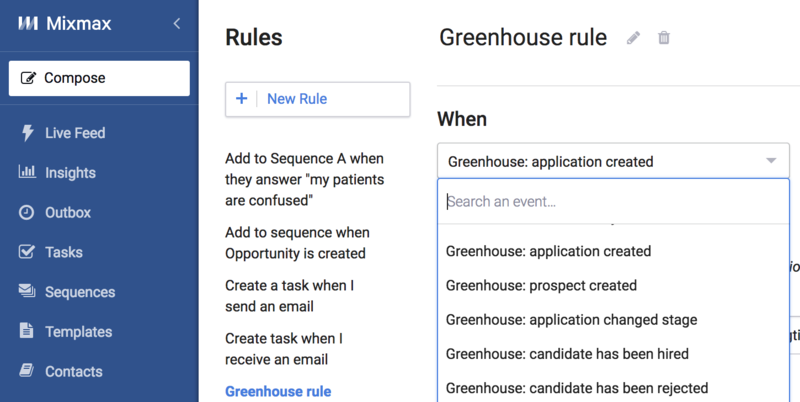 Enabling the Mixmax integration in Greenhouse will allow you to use Mixmax features, such as adding candidates to a sequence, inside of Greenhouse. 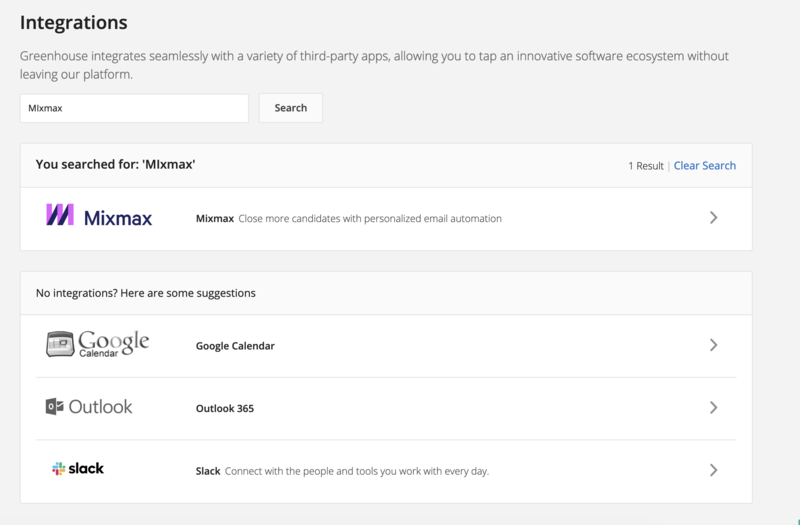 To enable the Mixmax integration, first go to the integrations dashboard in Greenhouse. Next enter "Mixmax" in the search bar. Click the Mixmax integration, scroll down, and use the toggle switch to enable Mixmax. You can now send a sequence from Greenhouse. 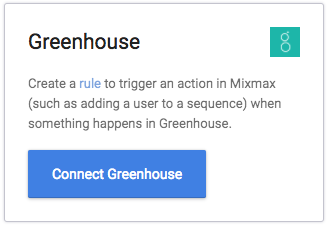 If you are a Mixmax organization administrator, you can connect to Greenhouse. Once you connect, everyone in your organization will automatically be connected, too. We recommend creating roles for people in your organization, and having a specific role for your recruiters, so you can get everyone set up with the correct sync settings (see below). You can also share effective templates and sequences with your team — here's an overview of what you can do with teams. If you're a team member, you can confirm that you are connected to Greenhouse using your team's settings. Go to the Settings section of the web app, and then click CRMs and Team Live Feed. Find the Sync to Greenhouse section. Choose which team's Greenhouse settings you want to use in the dropdown. If you are only on one team, you will automatically get that team's settings. If you are on multiple teams, you may need to choose the correct team from the dropdown. 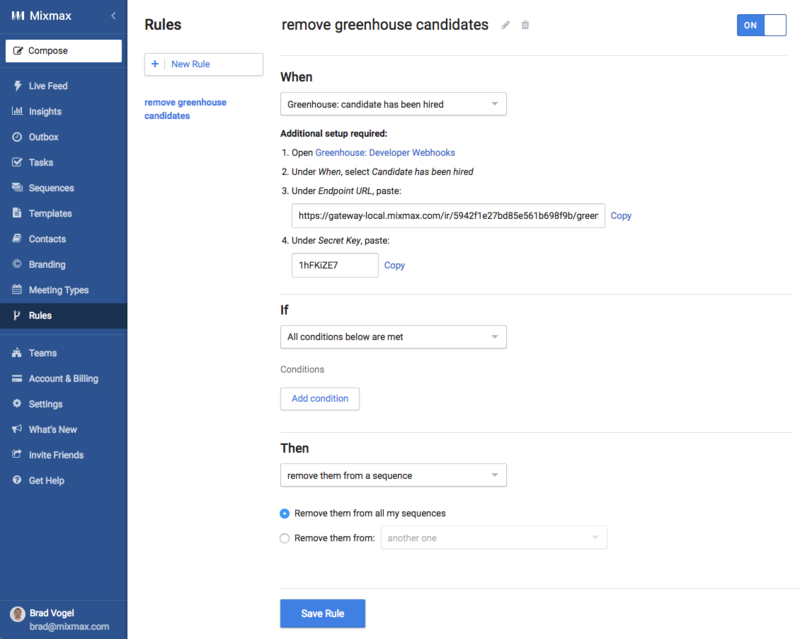 You can set up the integration so that whenever you send an email to an email address that is in Greenhouse, it will add a note to the candidate in Greenhouse. Even emails you send from mobile (without Mixmax) will be synced! 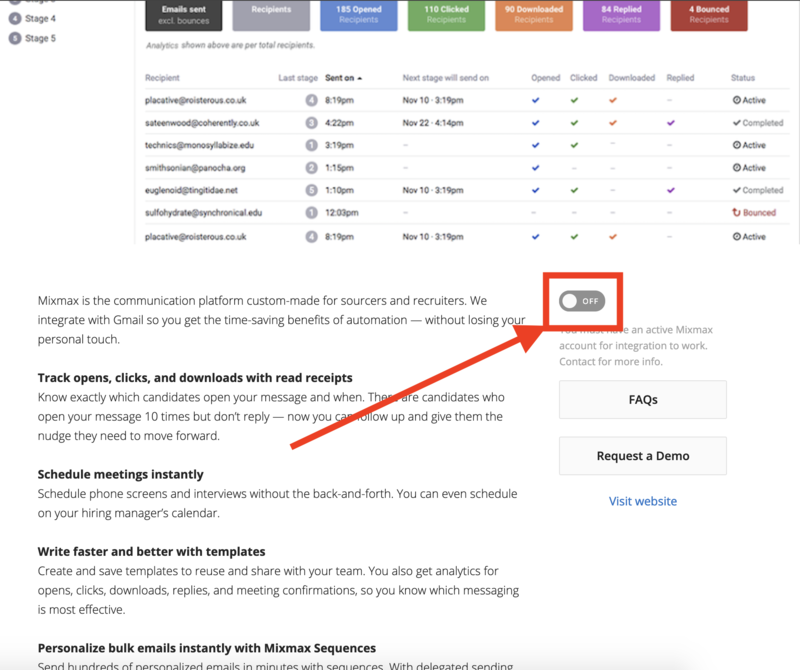 You can also sync candidates' opens, clicks, downloads, replies, meeting confirmations, and messages that you receive from candidates (even if they are not replies). Go to the Teams page and select your recruiting team. If you don't have a recruiting team yet, this is a great time to create one! In fact, you need to create a team to continue. Click the Greenhouse Settings tab at the top. Select whether you want to log the first activity of the selected types, or all selected activities. Select the activities that you want to log to Greenhouse. Settings are saved automatically, there is no need to save. 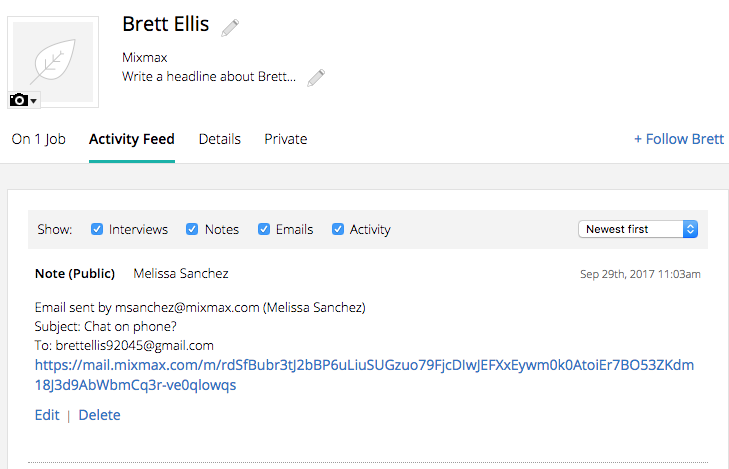 Mixmax will now post a note to the candidates's Activity Feed when the activities that you specify have occurred. 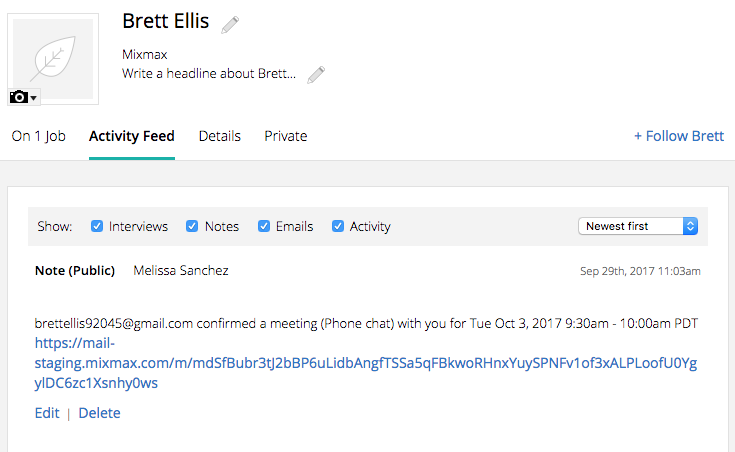 In this example, the candidate scheduled a meeting with you, using one of Mixmax's calendar options. The following example walks you through the process to create a Greenhouse rule. In this example, when a candidate is hired, the rule removes them from all of your sequences. This prevents you from sending cold outbound emails to a candidate who you have already hired! Open Mixmax Rules and click New Rule. Enter anything for the title. Under When, select Greenhouse: when a candidate has been hired. Follow the instructions under Additional setup required. Open up the Developer Webhooks page in Greenhouse. You may need to ask your Greenhouse admin to give you developer access. You'll copy the Endpoint URL and Secret Key from the Mixmax Rules page, and paste this information into your Developer Webhooks page in Greenhouse. Under Then, select the action that the Rule should take when the trigger occurs. In this example, select Remove them from a sequence. Click the radio button next to "Remove them from all my sequences." Alternatively, you can specify the specific sequence from which they should be removed. Make sure the rule is On, in the top right corner. If you'd like to create a rule using a trigger in Greenhouse that is not shown here, email us!